The National Leader of the All Progressives Congress (APC), Asiwaju Ahmed Bola Tinubu and Senate President, Dr Bukola Saraki in a dramatic move on Saturday held a secret meeting which lasted for about an hour in Birnin Kebbi, Kebbi State. Tinubu, had arrived at Waziri Umaru Federal Polytechnic, Birnin-Kebbi, venue of a book launch in honour of the Emir of Gwandu, Alhaji Muhammadu Illiasu Bashar, along Governors Abubakar Atiku Bagudu and Aminu Masari of Kebbi and Katsina states. However, at about 10:30am, Senator Saraki arrived in a separate vehicle and went straight to greet Tinubu who sat beside Governor Bagudu. Saraki extended his hand to the APC leader. who rose to greet him in a warm handshake. The closed door meeting which took place after the book lunch was held at the Presidential Lodge in Birnin Kebbi was the first of such between the duo since 2015 when Saraki emerged President of the Senate against the position of the leadership of the APC, an action which sparked no little row in the party. Speaking earlier, President Muhammadu Buhari, who was represented by Katsina State Governor, Alhaji Aminu Bello Masari, described the books as an act of rendering service to humanity, stressing that all Nigerians must work hard to sustain the unity of Nigeria. “The more we write books, the more we understand ourselves and the more united we become. What is important is that those who disagree should also write their books,” he said. The Sultan of Sokoto, Alhaji Saad Abubakar while speaking at the occasion, charged all Nigerians to embark on projects that would strengthen the unity of the country. The Sultan, who described the attendants of different personalities at the event irrespective of their religions as sign of unity in Nigeria, urged the books’ authors to adjust few fallacy in the books, stressing that few chapter distorted history. 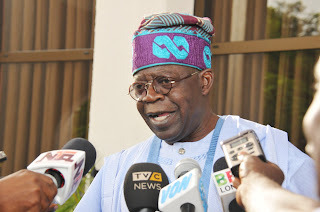 The Chief Launcher and National Leader of APC, Asiwaju Tinubu who harped on unity of Nigeria insisted that those who don’t want any particular region should remember that after expiration of any government, citizens must continue to live together in peace. He said our problem in Nigeria is not about economic poverty but lack of understanding of difficulties Nigerians are going through. He charged Nigerians leaders to preach peace and unity irrespective of their religions, tribes and geopolitical zones, saying “there should be no tribal war because we must share boundaries, coexist and share economic issues with ourselves”. Senate President, Dr. Bukola Saraki, who was the Chairman of the occasion, said he attended the event because of relationship existed between people of his constituency and Gwandu Emirate, stressing that he would continued to support any course that would promote peace and unity of Nigeria. The Senate President commended late Emir of Kano, Alhaji Ado Bayero for initiating writing of books to foster understanding and knowledge in the country, adding that the books would further brighten the future of Nigeria youths.